The components of the InfoAssist Application window are shown in the following image. Application button. Provides access to the Application menu of procedure-related commands. Quick Access Toolbar. Displays frequently-used commands, such as New, Open, Save, Undo, Redo, View code, Run, and Preview, in a toolbar that remains visible. For more information, see Quick Access Toolbar. Ribbon. Displays the commands you need to create reports, charts, and documents. It also displays the Help menu. For details, see Ribbon. Help. Provides access to the online documentation window for InfoAssist. Resources panel. Displays the fields from the selected data source in the Data pane. Also displays the Query Design pane below the Data pane, except in Query Design view. For more information, see Understanding the Resources Panel. Results panel. Displays the Query Design pane, Layout canvas, or Output window. The Query Design pane appears when you activate the Query Design mode. 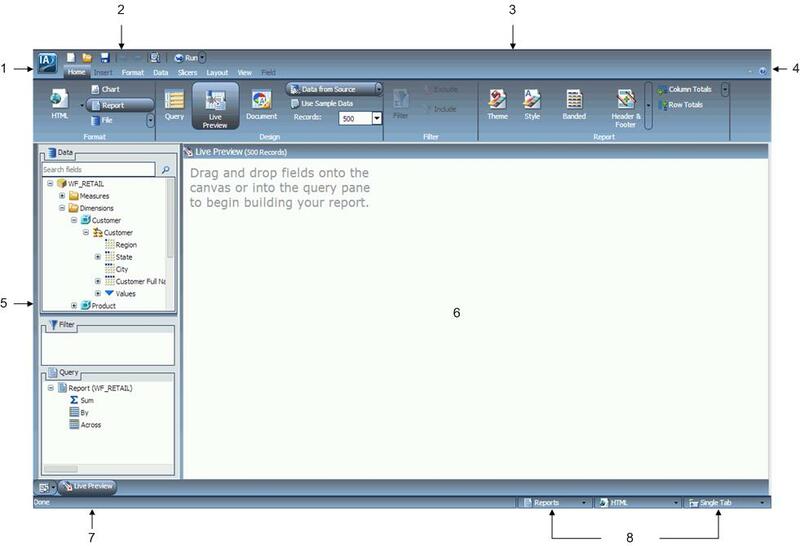 The Layout canvas appears in Live Preview mode when you create or modify a report. In Live Preview mode, the Results panel displays a preview of the report as you create the report. The Output window appears when you execute a report. For more information, see Understanding the Resources Panel. Navigation taskbar. Displays groups and icons that provide different views and quick access to all active reports and report output. For details, see Using the Navigation Taskbar. Status bar. Provides an output format button that you click to see the selected format and an output target button that you click to view the selected option for displaying new output windows or tabs. For more information, see Using the Status Bar.